2017 marks a special year for the vintage snowmobiles we care so much about. This year will mark the 50-Year Anniversary since the sale of the first Bolens Diablo Rouge Snowmobile for the 1967 production year. Plans are underway to bring people throughout the US and Canada to Port Washington, Wisconsin this coming January 14th to celebrate with a day of gathering in the city where Bolens had their manufacturing facilities, followed by an evening banquet with a meal and guest speakers. It promises to be an exciting day and evening for all who find the Hus Ski and Diablo Snowmobiles so special with media coverage, filming/documenting the event and special guests attending the celebration. The local Snowrunners Snowmobile Club is working with the City of Port Washington to develop a venue that includes a place to gather us and our machines, ride locally and some other special surprises. Like we did at the Hus Ski 50th in Alliston, we expect to showcase a Hus Ski and Diablo of each model. It’s possible a surprise sled manufacturer will be on-site to show off a current production “tow-behind” style sled new to the US & Canada. I’m especially excited about the banquet we are planning for the evening. Along with a good meal, we are planning a line-up of presenters to celebrate the Hus Ski and Diablo Rouge heritage. With luck, we will find a few Bolens employees who will also share their experiences. Before and after the banquet, there will be plenty of time to mingle and look at exhibits in the banquet hall. A number of great prizes are expected some of which include a full set of Diablo Covers, Hus Ski and Diablo clothing, Hus Ski and Diablo Parts and cool stuff from our sponsors of the event. Making hotel reservations early will get you a room at the beautiful Country Inn and Suites in Port Washington at significantly reduced rates. The Lakeview Conference Center where the banquet will be is attached to the hotel. 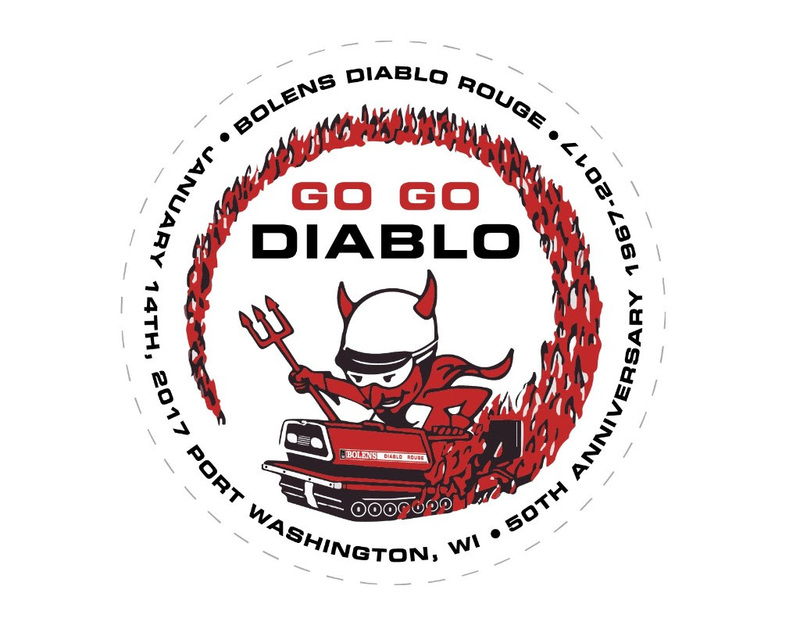 When making reservations by calling 1-262-284-2100, request your room be part of the Bolens Diablo Rouge 50th Anniversary block. There are a limited number of rooms available.The cost of the banquet has yet to be determined, so please bear with me until we commit to a caterer for the event.To encourage early registration for the banquet, we will be awarding prize tickets based on the month you commit to coming. For example, if in April you book your hotel room at the Country Inn or tell me you are coming to the banquet, I will put a ticket with your name into the prize drawing for each month before January 14th which is 10 tickets. If you and your significant other are coming, you both get 10 tickets in the drawings. However, if you wait until November to commit, you will get only 3 tickets. In addition, our own Barrie Graham is encouraging those doing restorations this summer to post your restoration progress on the forum. And if you bring your freshly restored Hus Ski or Diablo to Port Washington and attend the banquet, Barrie will draw and award a brand new pair of skis to one of you. Watch the forum for more details. There is so much more I wish to share but this announcement has already been too long. So I greatly encourage you to consider coming to Port Washington. I cannot imagine another time in the future where this many Hus Skis and Diablos will gather in one place or a banquet dedicated to these unique sleds will ever happen again. Please let me know if you have questions. Make your hotel reservations with the Country Inn. Make your banquet reservations with me. I will follow-up with further details as they develop through future newsletters. Hope to see a record crowd in attendance!